As closed churches wait for appeals in Rome, a pontiff’s visit stirs up complicated emotions. This article was originally published in Our Town on Sept. 28. About 20 blocks north from the United Nations, where Pope Francis gave a historic address to the General Assembly, sits Our Lady of Peace, a Catholic church shuttered in July by the Archdiocese of New York. The church was established soon after World War I, with peace a founding principle. Almost a century later, with a small but dedicated congregation and financial solvency, the archdiocese decided to merge Our Lady of Peace with the nearby Church of St. John the Evangelist on East 55th Street. The Catholic parish, established in 1919 by a growing population of Italian immigrants to the city and the neighborhood, was one of dozens closed by the Archdiocese of New York, which cited declining attendance, shifting demographics and a shortage of priests, among other factors, when it announced the merging of parishes from Staten Island to Albany late last year. Closing Our Lady of Peace made little sense to congregants, who have an appeal pending in Rome, even as Pope Francis was being cheered by huge crowds in their own backyard. Cappellini, 80, said many in the congregation are elderly and even the short walk to St. John’s is taxing. He also said the congregation hasn’t given up on saving the church. Weeks before Francis’ arrival in New York, members of Our Lady of Peace held prayer vigils in front of the church, which they’re continuing now that the pontiff has left. “The pope was so close, he went to the U.N. We tried to get [him] possibly to come by and we were hoping that Rome would keep us open until a decision on our appeal,” Cappellini said. “But it’s a question of how do you reach someone like the pope? My brother’s idea was have the pope come by to our Lady of Peace to pray for world peace,” he added. Cappellini said a nearby Slovenian church refused to baptize Italians before Our Lady of Peace came on the scene. A decision from the Vatican was postponed several times and is said to be forthcoming Nov. 1. Kalman Chany, a trustee at St. Elizabeth of Hungary, which also was shuttered in August, said Francis’ visit renewed some heartfelt and difficult emotions. As a whole, he said, congregants were left unbalanced by the visit. “There was a lot of support for the pope, but the same feelings aren’t shared for Cardinal (Timothy) Dolan,” he said referring to the archbishop of New York. Chany, a congregant at St. Elizabeth’s for more than 30 years, is also seeking recourse from the Vatican about the church’s closure. He said that St. Elizabeth’s, which served the deaf community, was financially sound. Decisions on appeals by both Our Lady of Peace and St. Elizabeth of Hungary were due sometime after Sept. 1 but were postponed. Janice Lynch, also a parishioner at Our Lady of Peace, said her supposition for the delay was based on Francis’ visit. “I don’t think they wanted to hand out a decision either way while the pope was here or before” for fear of embarrassing either Dolan or angering the congregation,” she said. 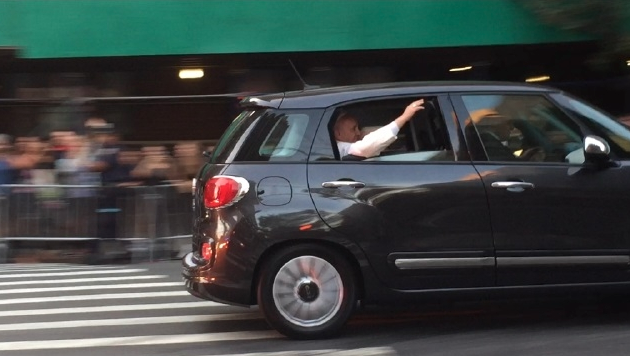 “There could be all kinds of hell breaking loose,” said Lynch, who was not attending any of Francis’ official functions but nevertheless twice caught sight of him on East 66th Street as his motorcade came off the FDR Drive. Lynch and other parishioners submitted five volumes of documentation, including financial records, to the Vatican in the hopes of overturning the Archdiocese’s decree. “I don’t know if he knows about the church closings,” she said. Lynch said was confident if was able to have a look inside Our Lady of Peace and be told of its history, Francis, whom she called “a very good man,” would endeavor to keep the parish open.